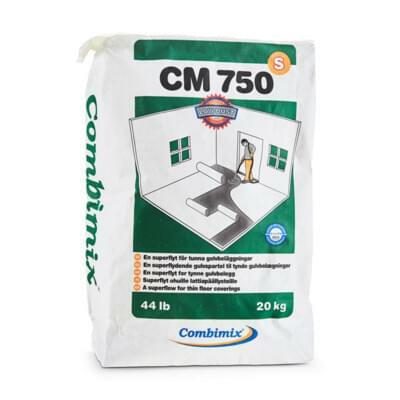 CM 750 S is a pumpable, self-levelling underlayment. The product is quick setting, selfdrying and has a very good flow rate. The CM 750 S is suitable for new construction and renovation. The product is intended for indoor use on substrates of concrete, lightweight concrete, stone, terrazzo and ceramic tiles. Do not use on wooden floors. The product can be used as an underlay for epoxy/PU-painting when the use is only ment for pedestrian traffic. The substrate should be clean and free of dust, cement skin, grease and other impurities that can prevent adhesion. Adhesion and surface resistance of the substrate should be no less than 72 psi. If CM 750 S is used as an underlay for epoxy/PU, the adhesion and surface strength of the substrate must be no less then 217 psi. If CM 750 is ment as an underlay for glued wooden floors, the strength of the substrate must be the same as demanded off the CM 750. Always prime the underlying substrate with PP 600 and allow to dry before pouring. In terms of the primer forming a film, the temperature of the substrate must not fall below 50 °F. For best results, the ambient temperature in the work area should be between 50 and 77 °F. At higher or lower temperatures, the time for curing will shorten or extend. With the risk for cracks due to shrinkage or settings in the subfloor, a concrete surface should not be leveled within the first 28 days after casting. As a recommendation the RH in the concrete should have reached RH 90 % as the upper limit for pouring the CM 750 S. Use the Combimix form foam for edging. In order to avoid drainage pipes from getting clogged, always make sure the drains are properly sealed before pouring. Mix the dry powder with max 5.1 qt (4.8 L) of water, max 21 %, per 44 lb (20 kg) bag. Manual Mix: Mix with a heavy duty ½” (13 mm), 650 rpm minimum drill and a whisk to obtain a lump free consistency. Mixing pump: Mixing pump intended for this purpose. Start pump at minimum of 135 gallons of water per hour and adjust as necessary to yield a self-leveling consistency. Please note that the production capacity and speed of the pump will dictate the gallons of water ratio per hour. The Combimix slump test must always be carried out to ensure the product performance and that the mixture is homogenized and free from separation. The correct water mixture can be tested using a slump test with a cylinder with Ø 1.18” and a height of 1.97” (Ø 30 mm and a height of 50 mm) on 11.8” x 11.8” (300 x 300 mm) plexiglas plate. With the correct water mixture, the spread should be max 5.9” (150 mm) for application thickness 0”–1/2” (0–12 mm). The slump test also checks that the material is well blended and that there is no separation. The mixed material is applied by hand, or pumped onto the substrate in lengths. Each new ribbon is added to the old one as soon as possible so that the material can blend together and create an even surface. The width of the ribbons can be adjusted to the capacity of the mixing pump and the thickness of the covering. The material requires a light treatment with a toothed trowel to provide maximum smoothness. Working time of the product is apx. 10 to 25 minutes. Application thickness 0”–1/2” (0–12 mm).